Stores 150 lbs. of ice. Direct Dispense — ensures that ice hits the glass every time. Quick Stop — prevents ice overflow and waste. 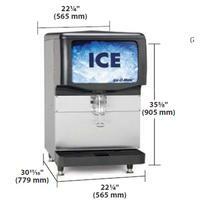 Perfect for cube or Pearl Ice® ice makers. 1" foam insulation for maximum ice preservation no more quick melting ice. Auto Rotate — turns the ice for four seconds every hour to consistently provide more dispensable ice. Maximum ice storage in a minimum amount of space.